Pupils with special educational needs (SEN) in England are dropping further behind their classmates in national primary school tests, statistics show. The gap between SEN pupils and their peers has risen from 48 percentage points in 2016 to 52 this year. 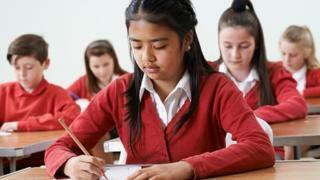 The figures are revealed in school league tables, published by the Department for Education (DfE), showing the results of about 16,000 primaries. Head teachers say special-needs education funding is in crisis. The government statistics show 18% of children with SEN reached the expected level in reading, writing and mathematics, compared with 70% of their peers without special needs. Although SEN pupils' results edged upwards on last year, when 14% made the grade, their non-SEN peers boosted their results more dramatically from 62% to 70%. Teachers have been warning that pupils with special needs, such as mild autism or dyslexia, would struggle in the tougher tests introduced last year. A National Association of Head Teachers' spokesman said it was "one of those situations where money is the solution and schools need the government's help". The tables also showed disadvantaged pupils still perform far worse than all other pupils in England, with around half passing the tests, compared to nearly two-thirds of non-disadvantaged. The gap between the two groups of pupils is now as wide as it was in 2012 at about 20 percentage points. However, there does appear to be a small catch-up (one percentage point) in poorer pupils' attainment on 2016 when the tougher tests were introduced and results for all pupils dipped significantly. NAHT general secretary Paul Whiteman said: "This data is a useful indication of school performance but it is not the whole story. One thing it does do, though, is confirm what NAHT has been saying for a long time about social mobility. "Raising the Key Stage 2 standard (Sats test) was not going to help close the gap. The issues that underpin inequality reach far beyond the school gates and exist throughout the communities that schools serve." But Schools Minister Nick Gibb hailed the achievements of pupils and teachers, saying they had responded well to the more rigorous curriculum. This set of pupils was the first to benefit from the government's new approach to phonics, he said. "Pupils are now leaving primary school better prepared for the rigours of secondary school and for future success in their education," Mr Gibb added. Overall, pupils have scored better in their Sats results than last year, which was the first year of the new tests. The DfE said this was partly because of "increased familiarity" with the new tests. There was a nine percentage point increase in the proportion of black pupils passing the tests, to 60% - just one percentage point behind the national average and white pupils. The top five local authorities were all London boroughs, with Richmond upon Thames at the top, Kensington and Chelsea coming second and Bromley third. The inner city boroughs of Hammersmith and Fulham and Hackney have claimed the fourth and fifth spots. In 1999, Hackney, which had been one of the worst performing boroughs, became the first local education authority to be taken out of council control. In this year's tests across England, local authority schools slightly outperformed academies and free schools, with 62% of their schools reaching the expected standard compared with 61% of academies and free schools. In all, 511 schools - 4% of the total - have fallen beneath the government's expectations or "floor standard", where fewer than 65% of pupils met the expected standard in reading, writing and mathematics and the school did not achieve sufficient progress scores in all three subjects. This is an improvement on last year, where 665 - 5% - primaries were found wanting.